When writing our last newsletter (Yes, I want to receive it too!) 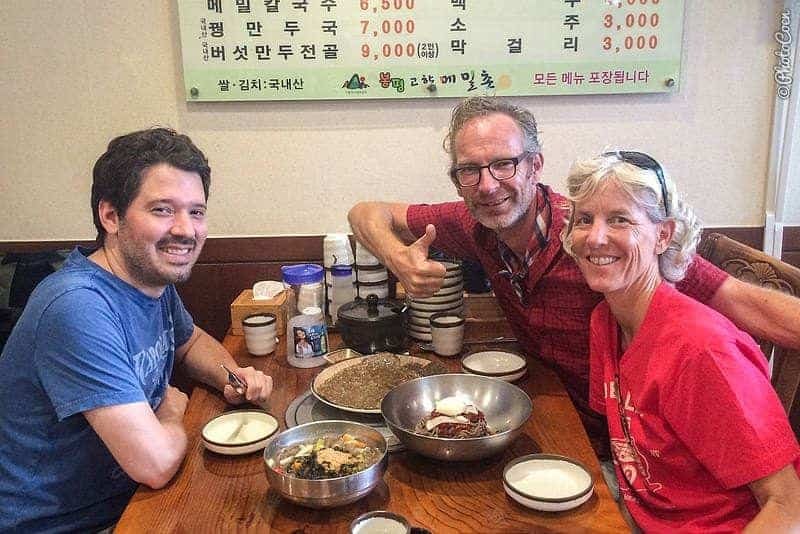 I was reminiscing about our 6-month stay in South Korea and started thanking people whom had helped us in one way or another. The list got longer and longer so I quit, deciding to dedicate a blog post to all those beautiful people and include photos. 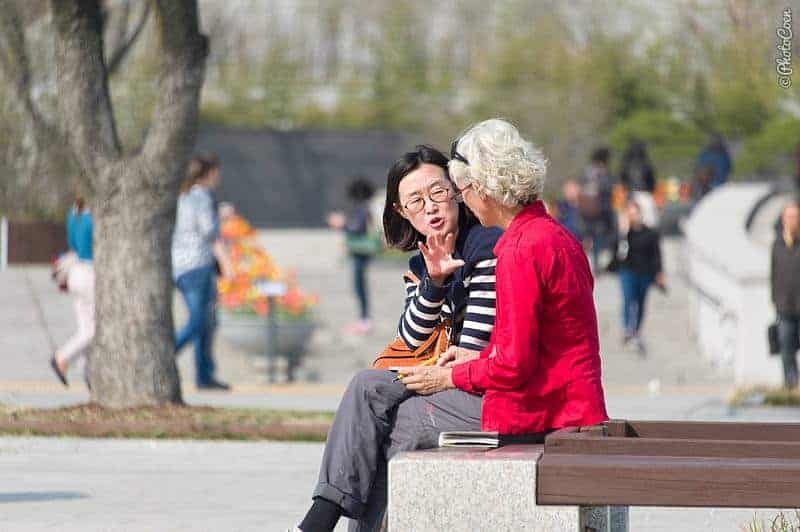 Truly, South Korean people are – in terms of friendliness and hospitality – among the top in the world, competing with Brazilians, Venezuelans, Colombians and Iranians as far as we are concerned. I guess this was something that surprised us most, which was simply a result of never having met a Korean before we arrived here! 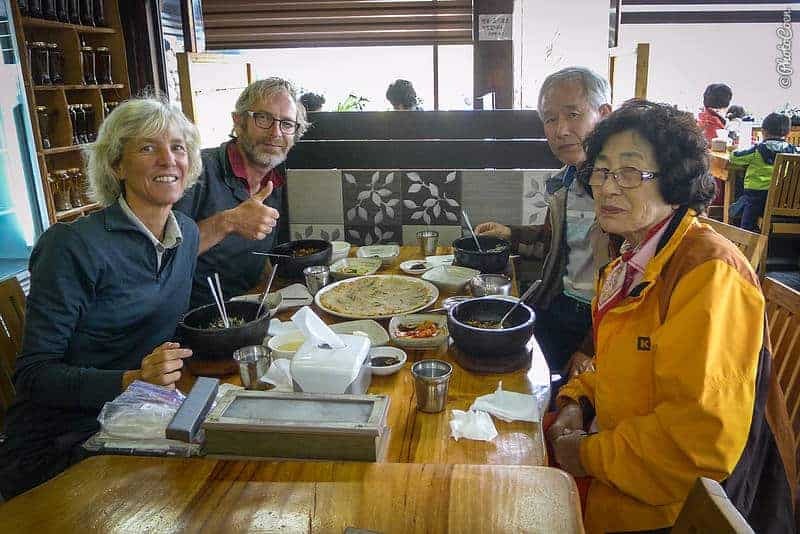 How extraordinary is it when a man asks you what they – Koreans – can do to make us – foreigners in general – more welcome in their country?! As I am compiling this list, I come to realize that writing blog posts featuring people we met (see here the Brazilian and Venezuelan posts) are among the ones I love writing most. My heart fills with such deep gratitude as I look back on our stay in this country, and fills with so much warmth when jotting down how many wonderful encounters we have had. Again, I wonder, where are all those people in the world we should fear so much?! And, again, I urge you all: go travel the world, get out of those cubicles, meet all those wonderful people. Stop meeting them (only) on your digital devices, TVs, and in newspapers. 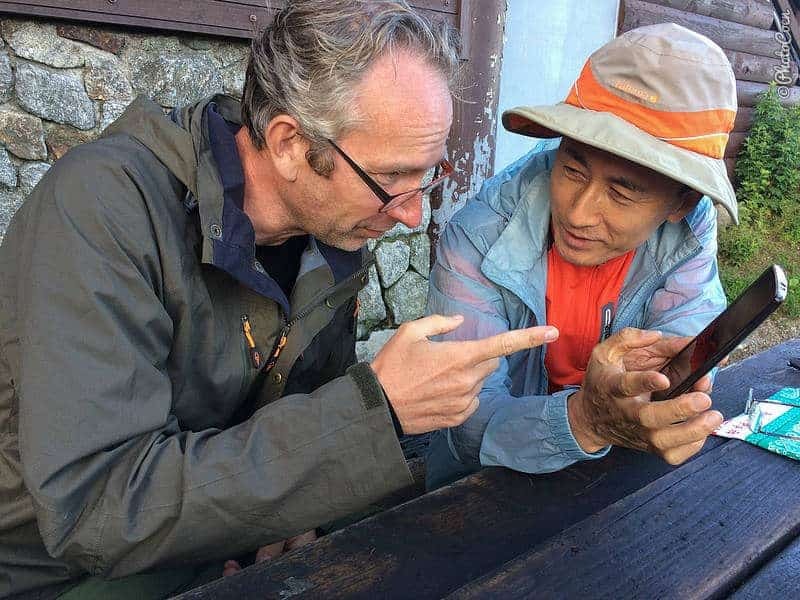 See and experience in real time how we human beings are connected – not divided! On that note: here they are, a list of wonderful people (mostly Korean and a couple of foreigners)! 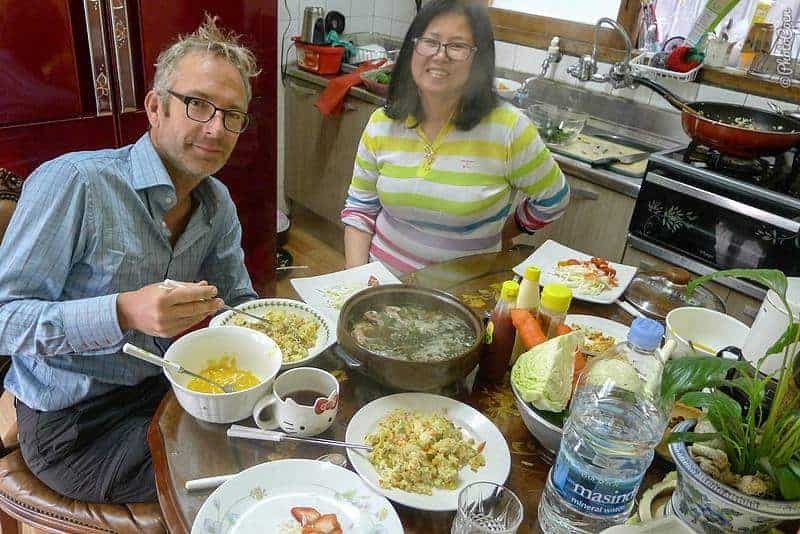 How awesome is that: Even before you’ve set foot on Korean soil you receive an email from a Korean you’ve never met who invites you to stay at his house! 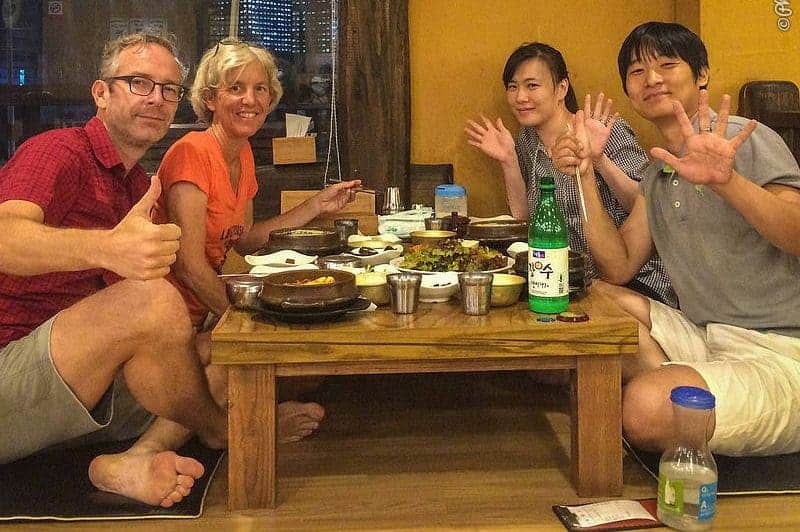 Jin and Sunna, thank you for hosting us on arrival, making us feel welcome in your country, teaching us about Korean food, doing some sightseeing together – ergo, spending a fantastic time together. 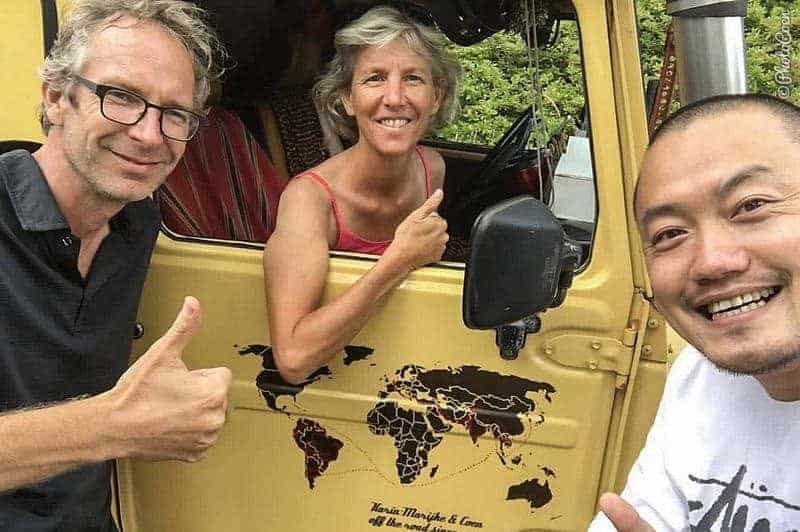 We wish you all the best on your own Pan-American Overland Journey! (Find their blog here). 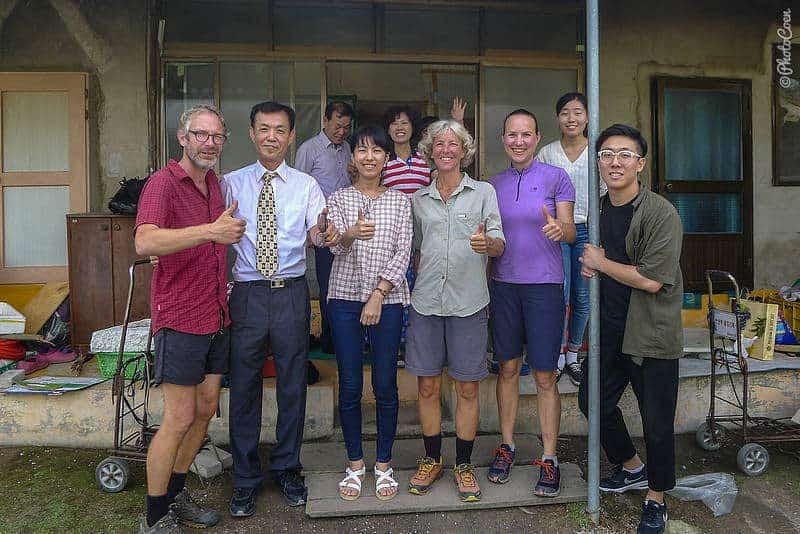 Rachel, thank you for walking up to the Land Cruiser for a chat and subsequently inviting us for a meal at your house, and even giving up your bed for the night! We hope your life will continue to be filled with travels. Fellow campers, thank you for welcoming you at your campsite, and sharing your food with us. We loved meeting you and having a drink with you! 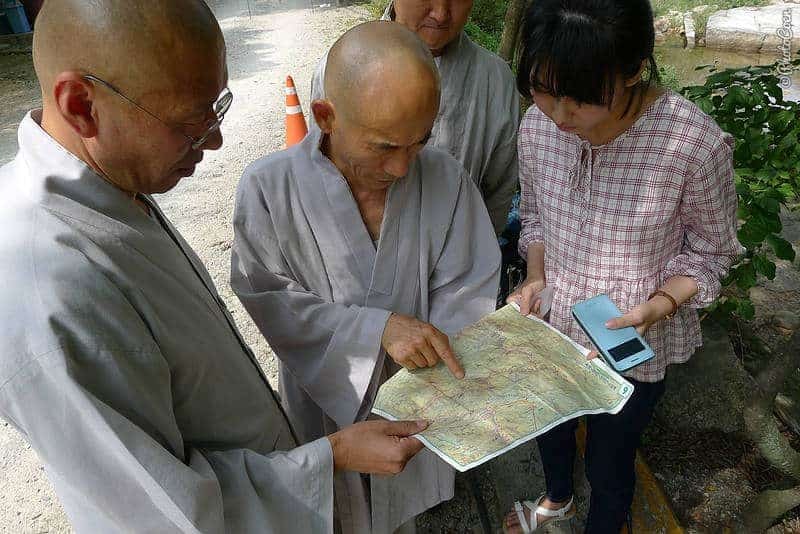 Woojung and other participants of the Vipassana mediation, thank you for your suggestion to go to Maisan National Park, and Woojung, for joining us for the day. 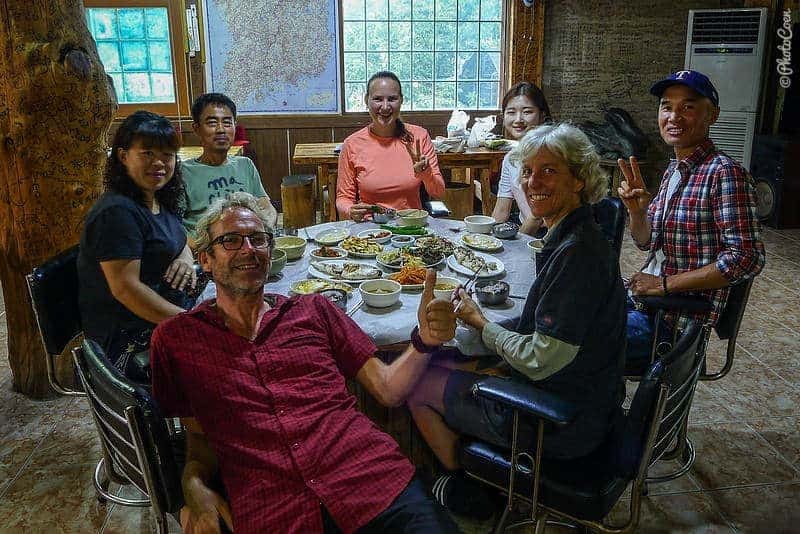 It was a great introduction to South Korea’s national parks! (Why don’t we have any photos with you?!). 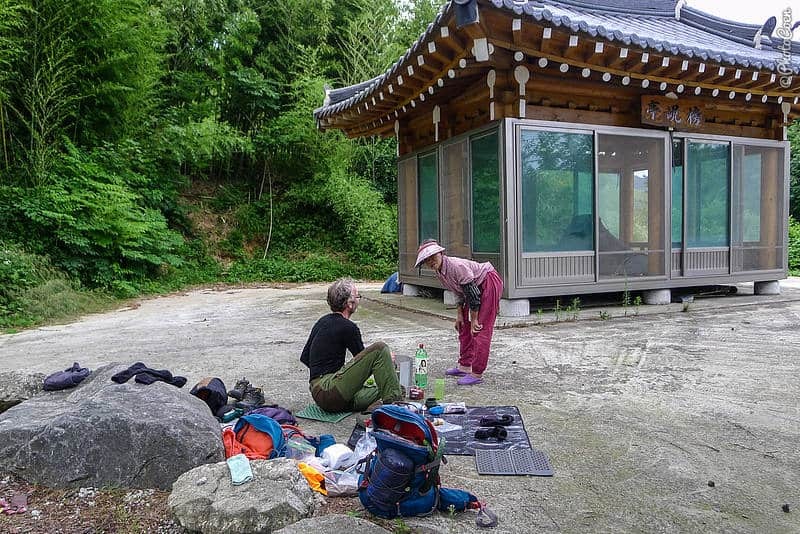 Jason, one of the first fellow hikers we met, at a shelter at Jirisan National Park. We shared his friend’s homemade wine and celebrated Jason’s retirement. Thank you for taking us for some excellent meals at Japanese restaurants, getting our car insurance extended, and having been generous in so many other ways. Who knows where our roads will cross next? Jason’s friends, whose name I awkwardly forgot to jot down. But the invitation of Jason’s nun friend is one we will remember. 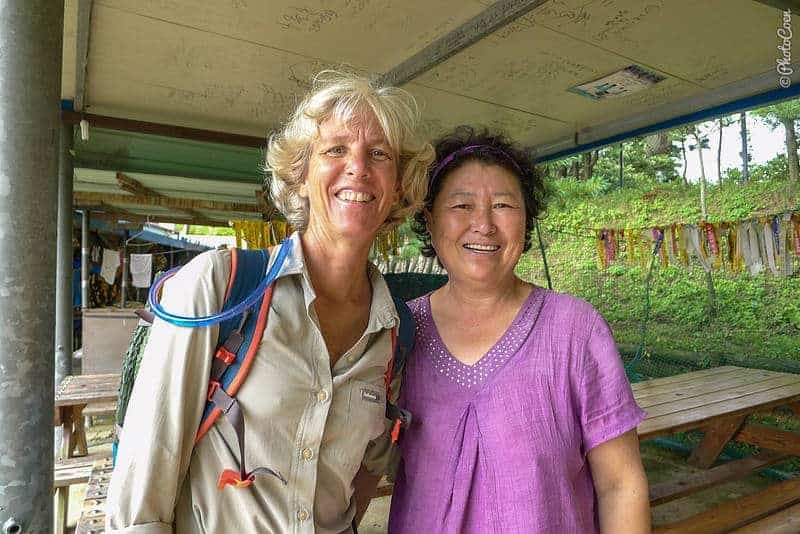 We changed our travel plans so we could take up her invitation to have lunch at her temple in the mountains. It was an unexpected and beautiful afternoon. 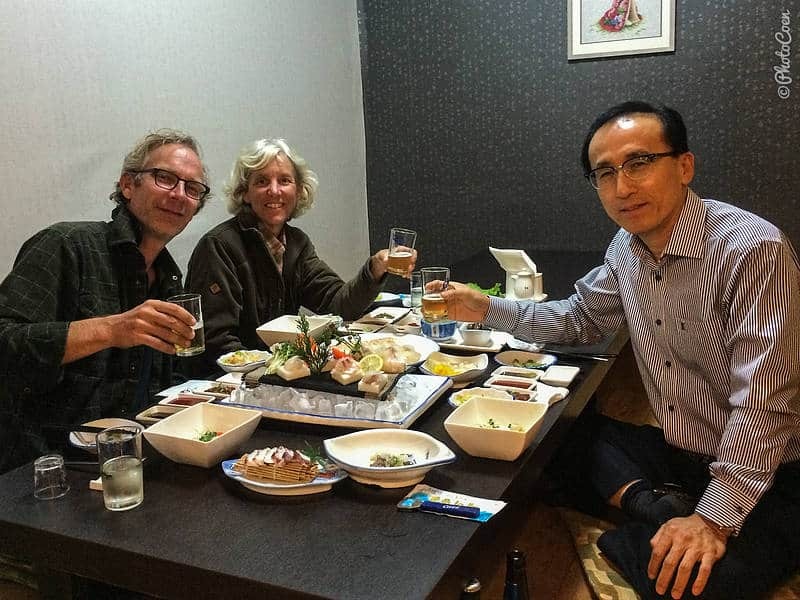 Mr. Baek and Yun Young, thank you for your friendship and kindness. Our Land Cruiser thanks you for having been safe in your parking lot for so many days. 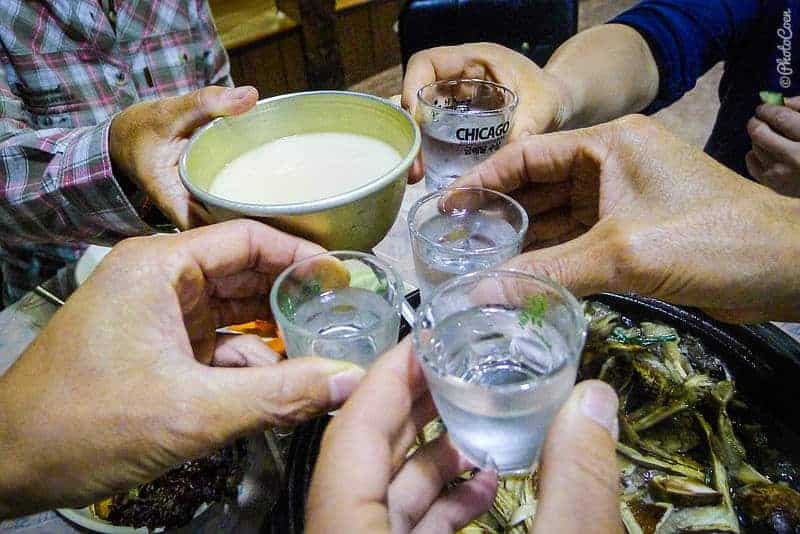 We thank you for your hospitality, for taking care of us when we stumbled into your home on a very low point during our the Baekdu-daegan hike, for taking us around Gimcheon so we would be better equipped on the hike, for all the soju and makeolli and the good laughs that followed. We admire your great spirit! Imjae-ha, without whom the Baekdu-daegan would not have been the same. 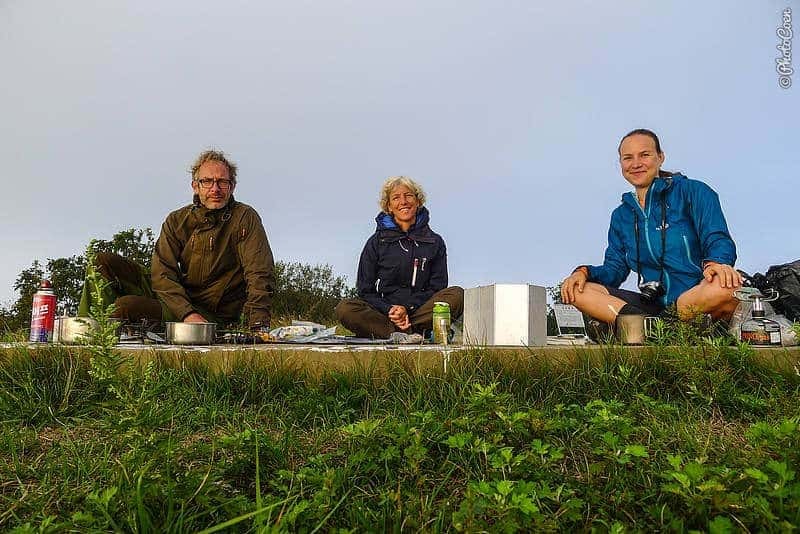 Thank for your spontaneous visits on the trail, for the excellent dinners and breakfasts you cooked for us, the camping spots you shared with us, the laughs we had, and the days you hiked with us. We wish you many more excellent hiking and climbing days! 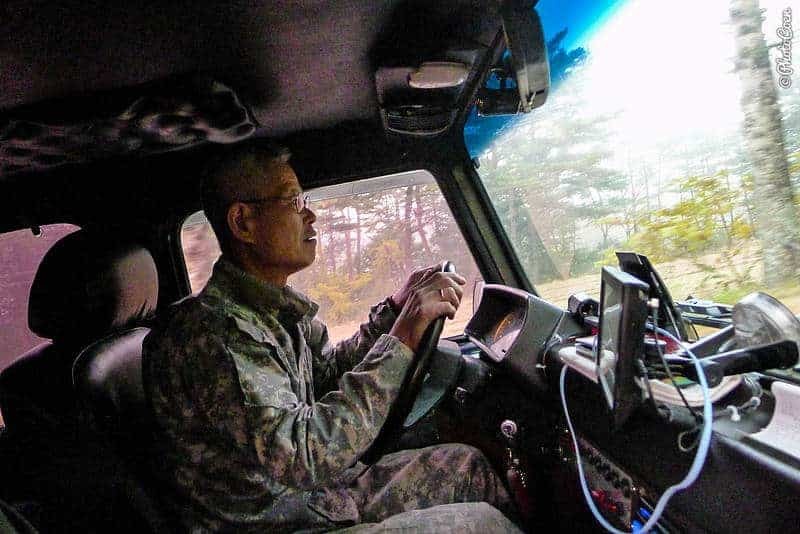 Jonhae, one of the most extraordinary, strong men we have ever met on our journey. We didn’t meet you on the Baekdu-daegan, yet we are partly connected because of it. 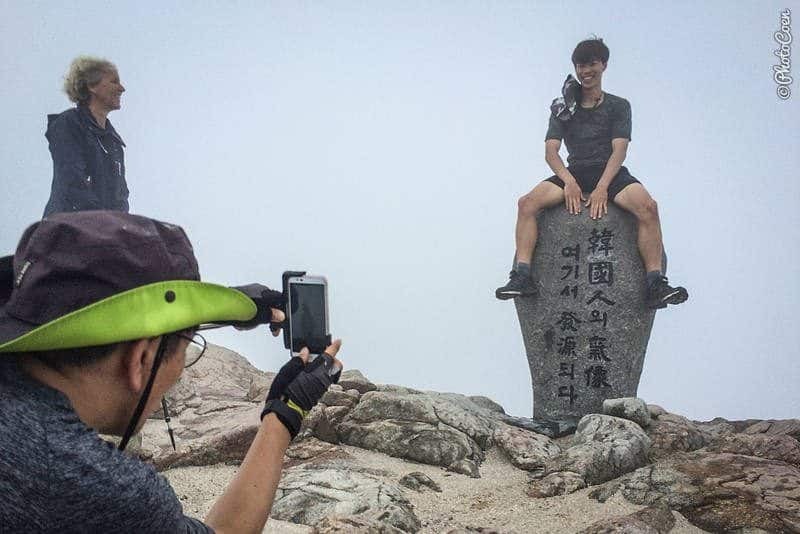 Having hiked it 3 times, like you did, is beyond our imagination! 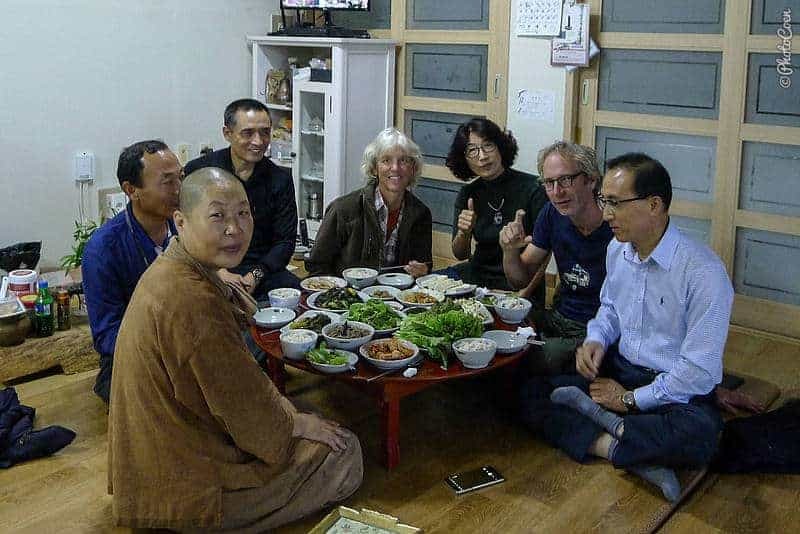 Thank you and Minsook for sharing true mountainous food with us, and allowing us to be part of a Baekdu-daegan ‘thank-you’ ceremony. We wish you all the best and hope you will recover soon! Stefanie, of course a big thank you to you. 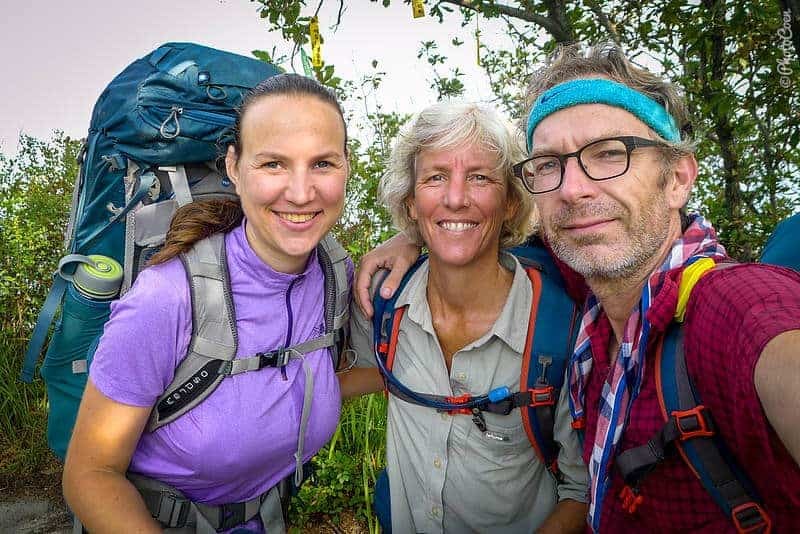 Thank you for sharing the trail, the challenges, for being supportive when things went wrong. Thank you for making my belly hurt from laughing! And thank you for your wise words – we wish you many more beautiful projects! 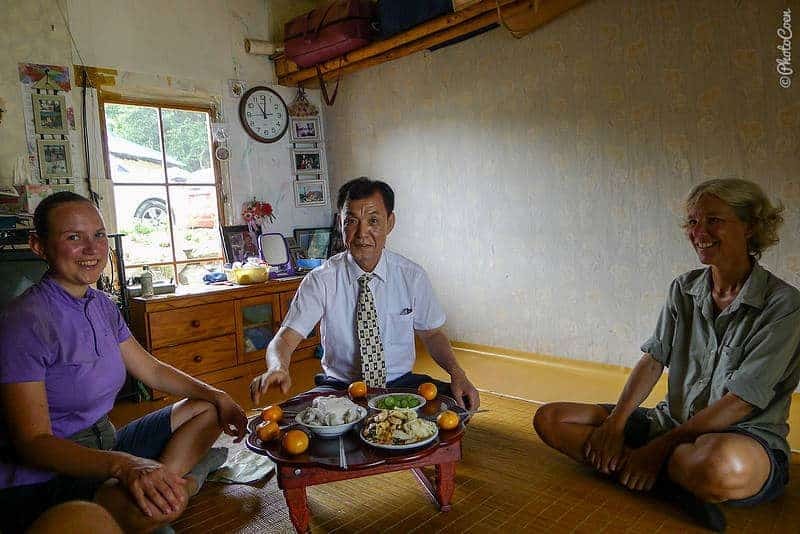 Mr. Lee Kyeong Hee, thank you for inviting us to eat something at your home during Korea’s special holiday of Chuseok. We feel privileged to have been part of it for a moment, and to have met your family. 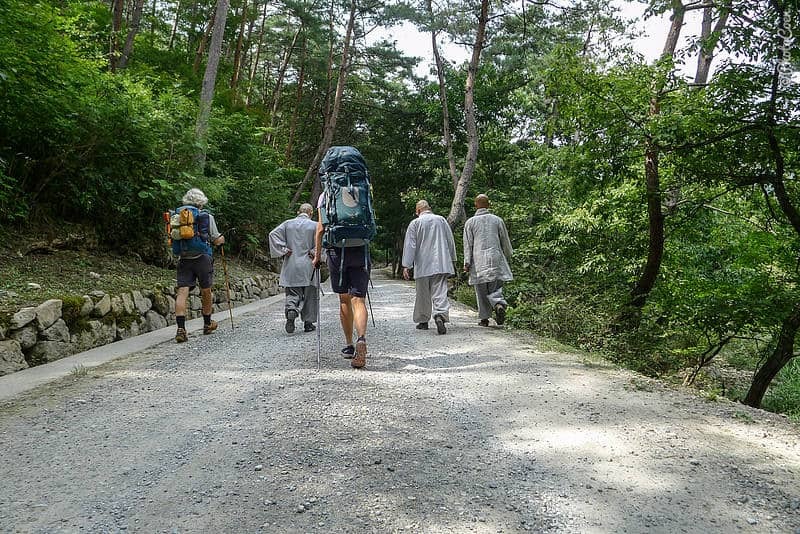 Jukmun and Sung Hwui, thank you kind monks, for guiding us around the closed-off trail around Bongam-sa (one of Korea’s most sacred monasteries, which was closed due to Chuseok) and back on the trail. It was an adventure! 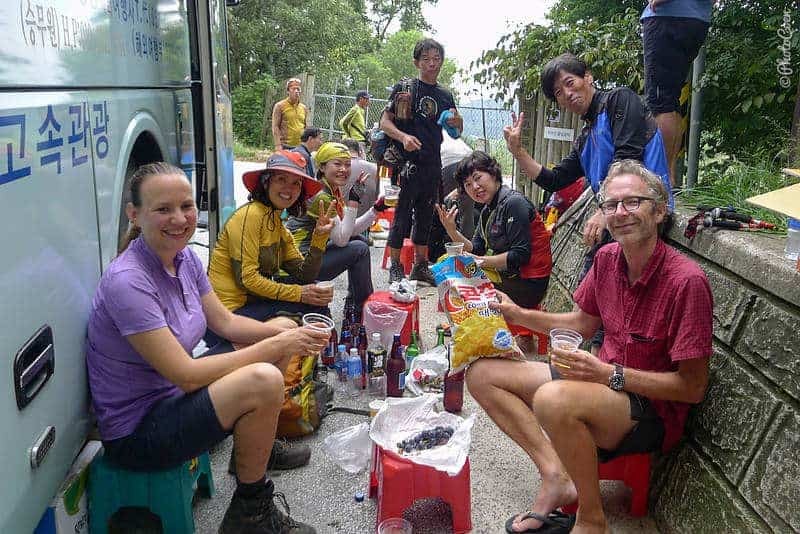 Thank you fellow hikers for sharing your watermelon, eggs, gimbap, soju, and candy. 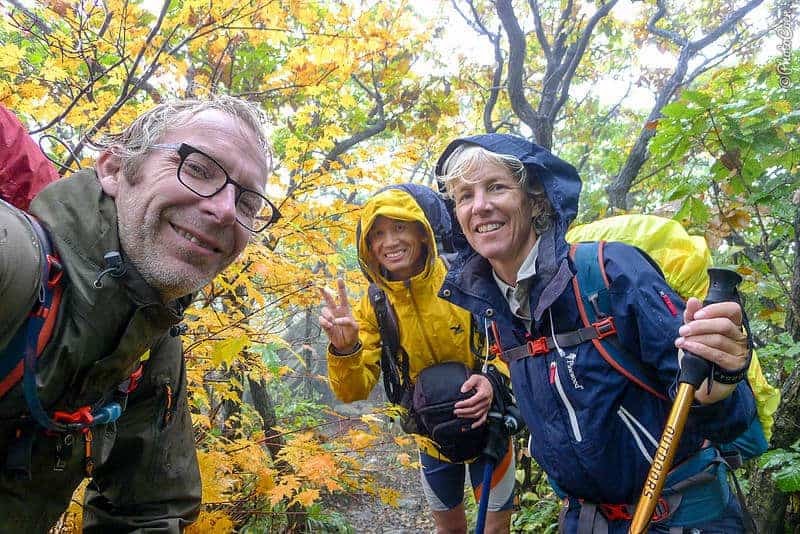 One of the many hiking groups who – as a rule, it seems – are fun and super generous. Sure we love a beer! Thank you people who live along the trail, for all those cucumbers, apples, and grapes. We were, and are, eternally grateful for the gesture as well as the opportunity to eat something else than noodles! Grape harvest and this man stopped in the middle of the road, offering me this. I politely took a grape; no, obviously I had to take the whole bunch! “Here, take cucumber, paprika, a rol of toiletpaper,” offered a woman who’s actually selling food for a living! “Do I need to take your clothes to wash in my machine?” this old woman sign languaged after she had disapproved with my hand-wash result (understandably…). She wanted to know what Coen was cooking, went home and returned with ‘real’ food: hot peppers and a sauce. She took me by the hand, leading me away from the well (“no good water to drink”) and showed me the tap in a garden to fill up our bottles. Truly special. We stood in front of a minbak that was closed. We approached this couple, that were just about to leave the national park, asking them to call the minbak for us. “Oh, stay at our place, no money, we live nearby.” A lovely evening followed. Thank you Hong Young Hee and Park Young Il! Thank you strangers, for not hesitating to give us a lift even though we were dirty and no doubt smelling after so many days on the trails. Yet you let us sit in your fancy, clean cars, not just giving us a lift but often going out of your way making sure we got where we needed to be. 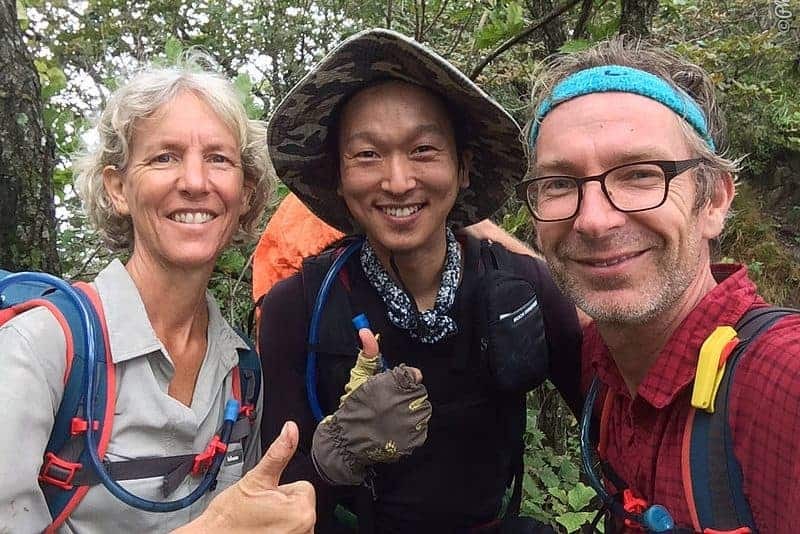 During all the challenges on the trail it was just wonderful that getting around closed sections, or to get to or from a place to eat or sleep was so easygoing! 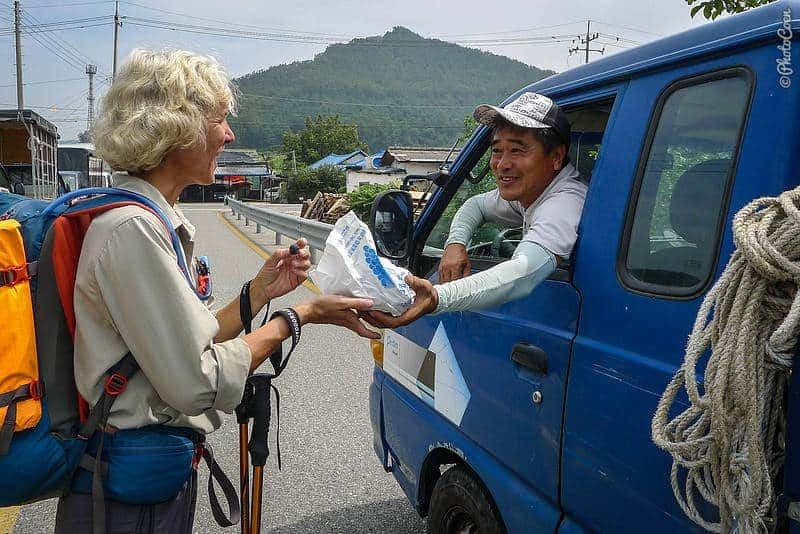 This couple gave us a lift to Seoraksan National Park. 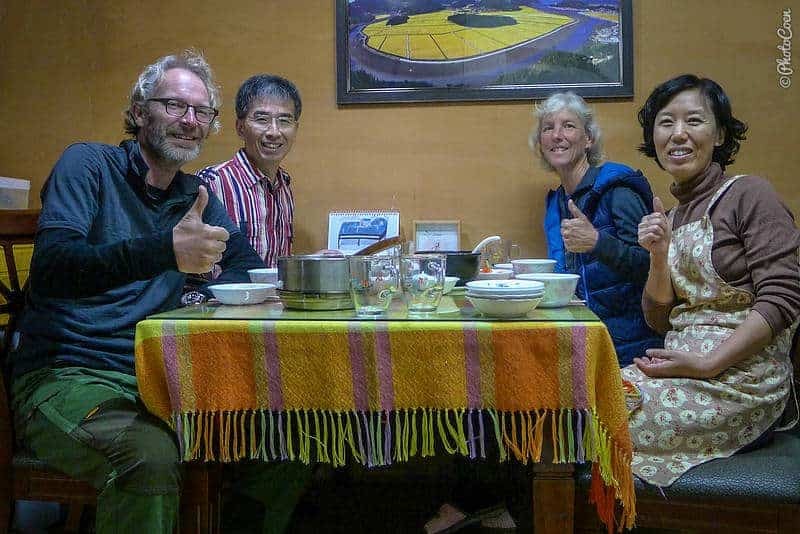 We couldn’t exchange one word with them but in sign language they invited us for lunch at the restaurant of a rest area and wouldn’t even allow us to pay for the coffee. 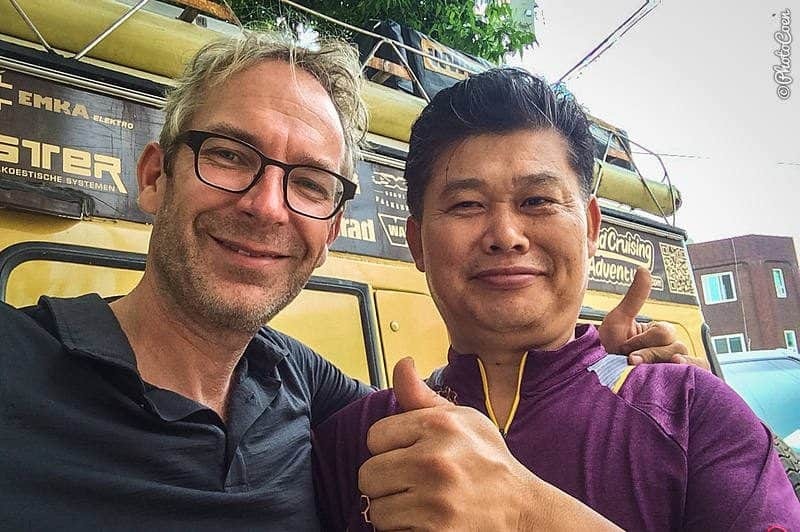 Our first hitchhike attempt succeeded quickly, thanks to this man taking us within minutes. Coen had left his shirt at the previous minbak (B&B). 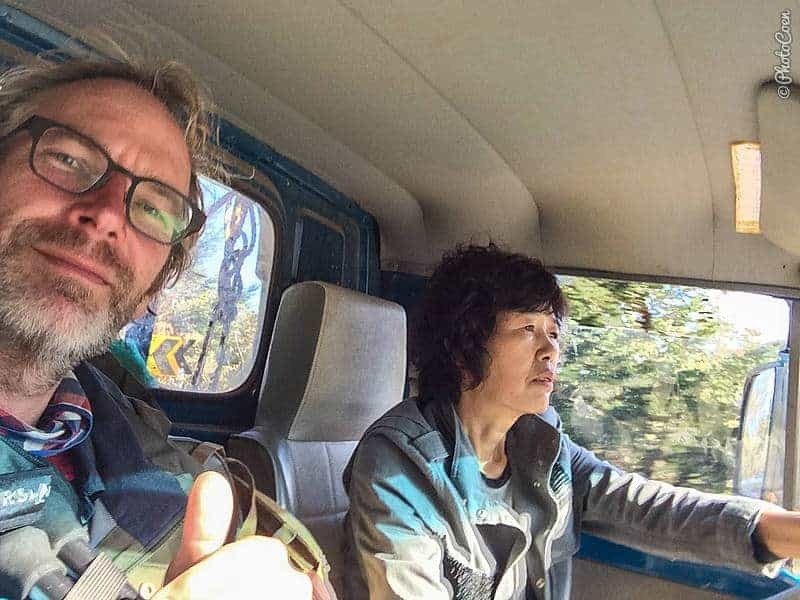 This couple drove him all the way there, 40 minutes, which gave them a detour to their home in Seoul. “never mind”. 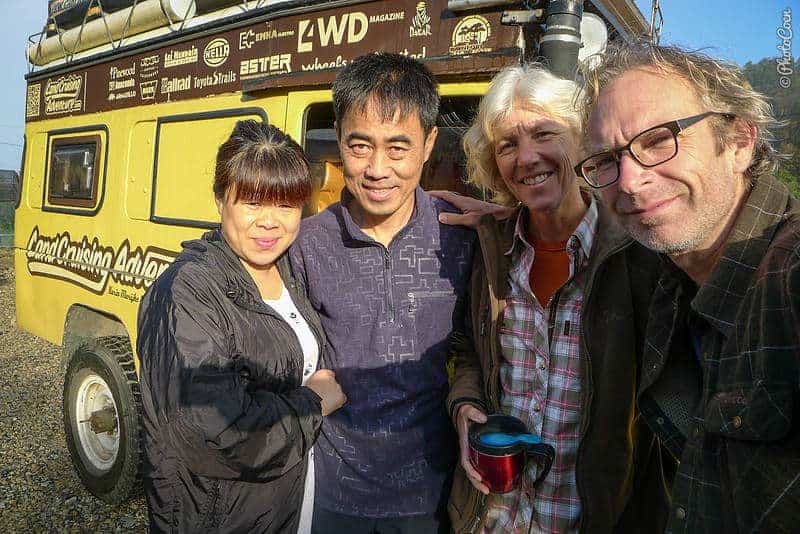 Wendy is the person known in the motorcycle overlanding community. She helps most if not all of them to retrieve their motorcycle after they’ve been flown in and organizes car/motorcycle insurances for overlanders. 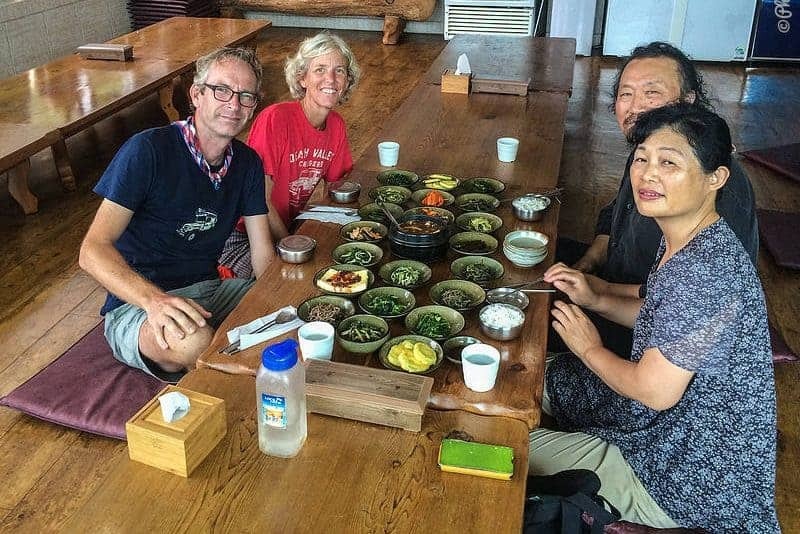 Thank you for helping us figure out the bureaucracy as well, and spending a lovely afternoon along the Han River, sharing a meal afterwards. 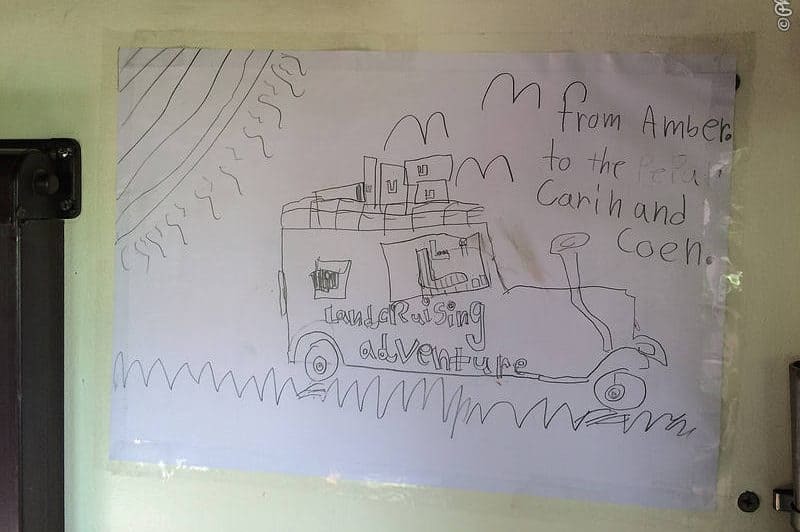 I hope you’ll stick around for future overlanders! 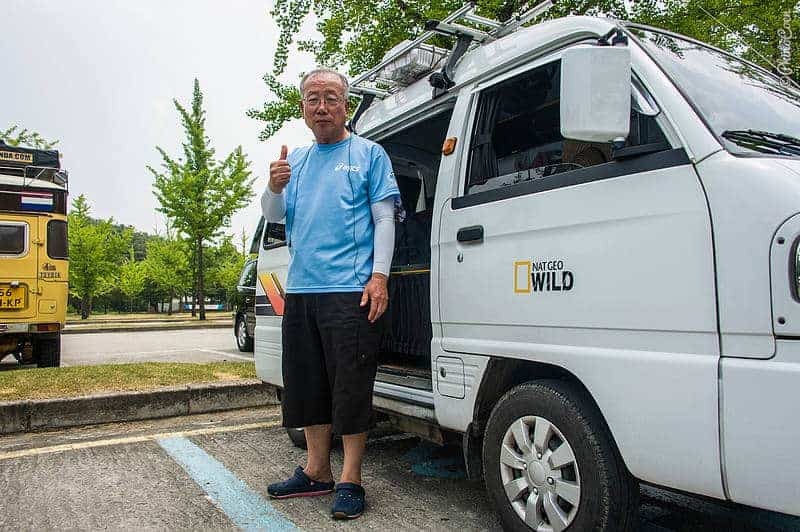 Decal workshop in Suwon, thanks for getting our new decals on the Land Cruiser! 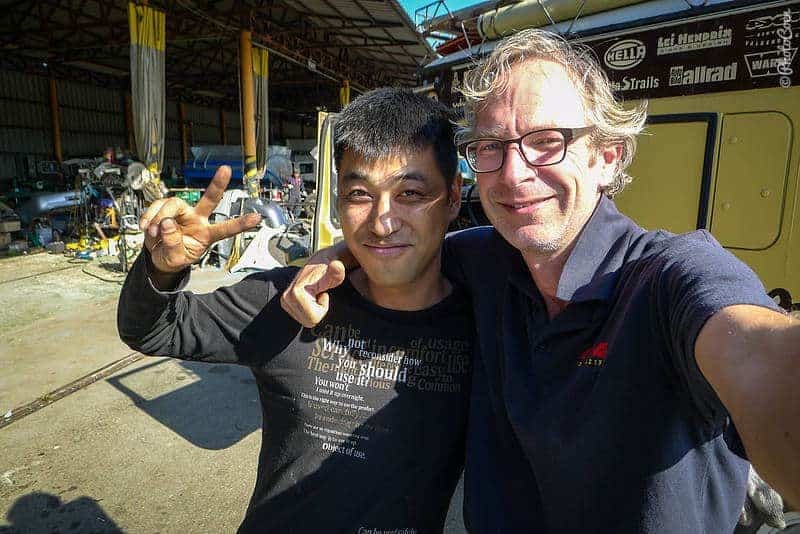 Peter, whom we met the day we retrieved the Land Cruiser from the container; he turned out to be the commercial director of the terminal as well as a fellow Dutchman! 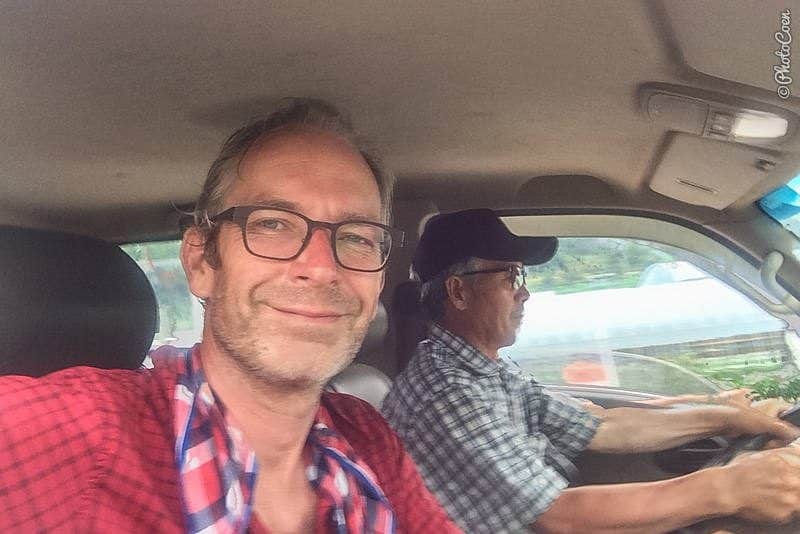 Thanks Peter, for putting up with our questions, allowing your home to serve as post address, and sharing a family dinner with us at your home. It was lovely to meet your wife and fun daughters! Drawing of the Land Cruiser by Peter’s 7-year old daughter Amber. Matthew and Eukyoung, thank you for sitting on those packages for so long. 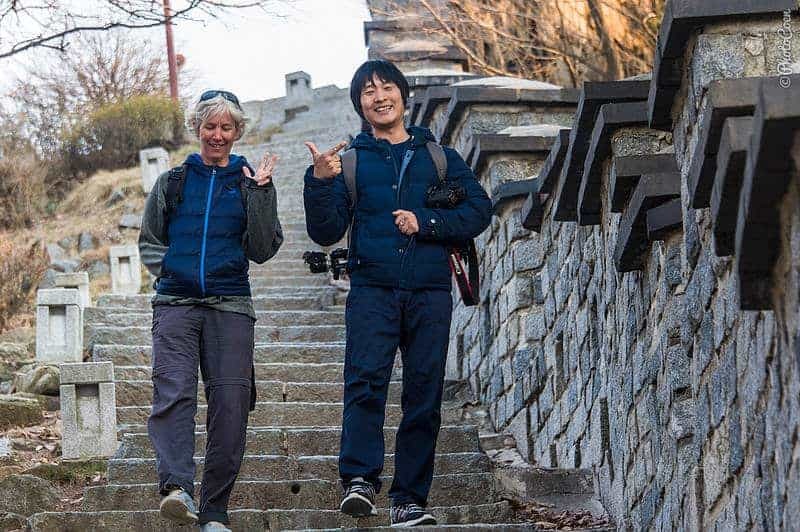 Thanks for sharing makeolli and so many good laughs with us and we really wish we had the time to return to Seoul. We very much hope our roads will cross again one day! 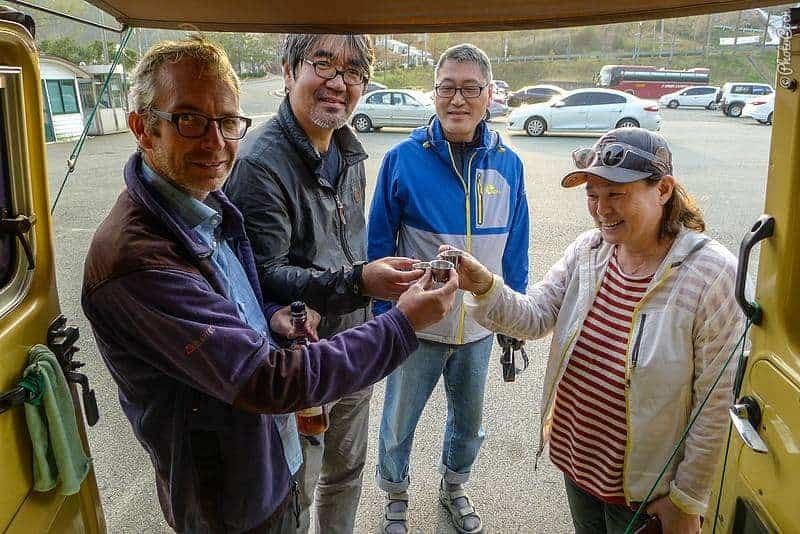 Workshop in Chungju, thanks for that temporary fix of the hole in the freeze plug, allowing us to safely and timely arrive in Busan to get on the ferry to Japan! Spending an afternoon in good company. Learning from these young Koreans about “hell Joseong” and how they are trying to break away from the highly competitive environment in this country. In a way a kindred spirit. Same same but different. 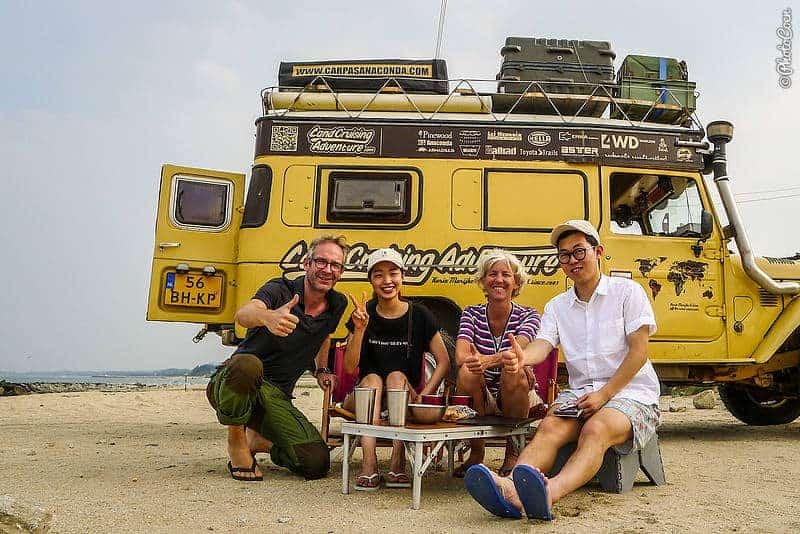 While there are not many international Korean overlanders (yet), quite a few Koreans ‘overland’ within their own country, having rebuild a car into some sort of camper, like this man. At an abandoned gas station, this man drives to our car, stops alongside the Land Cruiser, gets out and hands me a big box filled with small packages of apple juice. It’s apple harvest season. “My mother has an apple orchard, she just made this apple juice herself,” he explained. Then there so many of you Koreans with whom we just spent a second, a minute. 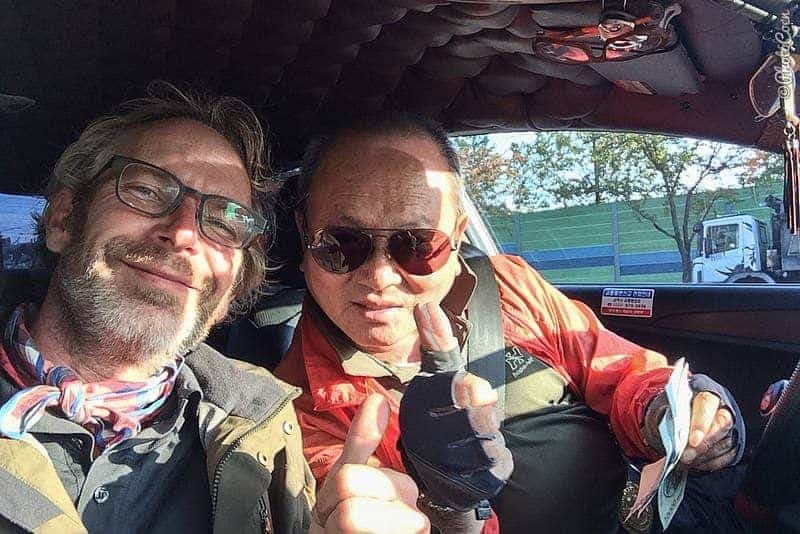 A short exchange, a thumbs up on the road, a lift, a smile. A gift of coffee or vegetables from your garden, sometimes given so quickly we could hardly stutter a thank you before you had left again. You’re always welcome, whether our paths cross again in Seoul, or elsewhere. Safe travels to you both!